Welcome to SunMaster Products, San Diego County's premier custom-designed sun shade system manufacturing and installation specialists. At SunMaster, we have designed, expertly-crafted, and precision-installed stationary and retractable awnings, canopies, solar screens, blackout shades, drop roller shades, sunroom shades, skylight shades, and patio cover shades at affordable prices for homes, businesses, industrial facilities, and institutional clients throughout San Diego County and the surrounding areas since 1971. In addition, during this time, we have also provided San Diego businesses and manufacturers with expert die cutting and contract/production sewing services. During our over four decades in the industry, we have serviced tens of thousands of satisfied clients, including businesses, schools, hospitals, manufacturing companies, the United States Military, and even Qualcomm Stadium, and have a well-established reputation in Carlsbad and throughout our service area for providing exceptional quality work and excellent customer service at very competitive prices. At SunMaster, we are a family owned and operated business, and are committed to offering Carlsbad personalized customer service in combination with premium quality products. 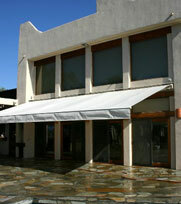 We custom fabricate all of our own fixed and retractable awnings; canopies; solar shades; blackout shades; and patio, skylight, and sunroom shades onsite at our North San Diego County manufacturing facility, and do not outsource any manufacturing procedure: effectively eliminating the "middleman" from our production process. For this reason, we are San Diego County's best value for custom shading systems of all types, as well as the first choice for many local businesses and manufacturing facilities for competitively priced die cutting and commercial sewing services, also performed onsite at our state of the art, full service production die cutting and sewing workshop. 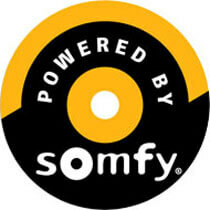 Call the sun shade system and production sewing specialists at SunMaster Products today. We provide free onsite consultations and estimates to Carlsbad and all of San Diego County and the surrounding areas, and accept Visa, Mastercard, Discover Card, and American Express. Our office hours are Monday through Friday, from 8:30 am to 4:00 pm. SunMaster Products, Inc., is licensed, bonded, and insured. At SunMaster, we provide expert fabric die cutting and production sewing services to Carlsbad. We can perform both low and high volume contract sewing for our valued clients, and have no minimum requirement on the number of items produced per contract. 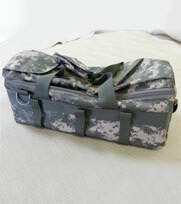 We have the capability of executing both light duty and heavy duty material assembly, and can work with an extensive array of fabric types as well as many other materials, including: cotton, polyester, nylon, acrylic, kevlar, leather, vinyl, lycra, pvc-coated polyester and fiberglass, webbing, open and closed cell foam, cordura, and thin plastics. In addition, we can also attach any and all necessary project hardware, such as zippers, hook & loop fasteners, buckles, velcro, snaps, and grommets. 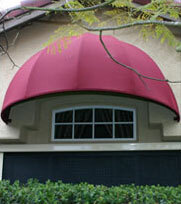 Trust the awning experts at SunMaster to design and install your Carlsbad business or industrial property's awnings. At SunMaster, our highly skilled craftsmen pride themselves on adhering to only the highest standards of quality workmanship, and construct our shading system products to last for years to come. All of our fixed and retractable awnings are available in an extensive selection of fabric colors, patterns, and types, and over 100 powder coat frame finish colors, and we proudly feature Sunbrella fabrics – backed by a 10 year warranty. Moreover, our custom graphics are hand-painted by a professional graphic artist, in an extremely durable fabric grade latex paint that will not fade, chip or flake. Call us today. Our skilled craftsmen can expertly recover existing fixed or retractable awnings of any design or size, granting them a whole new lifespan and saving our valued Carlsbad residential and commercial clientele up to 60% of the cost of complete awning replacement. And in addition to performing awning recovering, we can also recoat existing awning framework with a choice of over 100 powdercoat color finishes, increasing its durability and extending its longevity for years to come. We can also design and fabricate tarps and equipment covers for Carlsbad businesses and industrial facilities. Our extremely durable tarps and equipment covers can be sized to fit any type of equipment or machinery, and provide this equipment with a very effective shield against the elements. Rely upon SunMaster to design and install the perfect patio cover shade for your Carlsbad home or business. At SunMaster, our retractable patio cover shades feature the C.A.S. System™. The C.A.S. System™ is a motorized track guided system which was originally developed as a sunroom shade, due to it's ability to extend and retract over curved glass surfaces. However, over the years this system has been adapted for use in retractable covers for a wide range of structures, including wood and aluminum patio covers, as well as curved and flat glass skylights, and cannot be surpassed for both its efficiency of operation as well as its durability. At SunMaster, we can design and create fixed awnings and canopies that can be used for any Carlsbad residential, commercial, industrial, or institutional application imaginable, and are known throughout our San Diego County service area for our unique designs, the exceptional quality and durability of our products, and our competitive pricing. 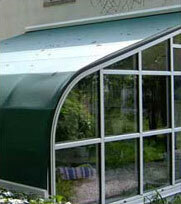 Depend upon the awning specialists at SunMaster. At SunMaster, our highly skilled, experienced craftsmen pride themselves on adhering to only the highest standards of quality workmanship, and build our retractable awnings to be durable, and also to function beautifully for years to come. Our retractable awnings can be covered in an extensive selection of fabric types, colors, and densities, and all framework is available in a choice of over 100 powdercoat color finishes – with a shade available that is certain to complement any Carlsbad residential or commercial property's exterior. At SunMaster, our exterior sunroom and skylight shades are available to Carlsbad in an extensive selection of fabric colors, types, and densities, both solid and open weave, and feature the innovative C.A.S. System™. The C.A.S. System™ is a motorized track guided system with the ability to extend and retract over both flat and curved surfaces, and which was originally developed for use in curved eave sunroom shades. However, over the years, this highly efficient operating system has been adapted for use in retractable covers designed for a wide range of both flat and curved architectural features, including wood and aluminum patio covers, curved and flat glass skylights, and in sunroom shades for sunrooms by any manufacturer, in every design imaginable, including gable roof style and flat slope roof style sunrooms. Drop roll curtains and shades are a very effective way of providing large outdoor spaces with protection from sun, wind, and rain, as well as for adding desired privacy. At SunMaster, our drop roll shades can be mounted to both wood and aluminum patio covers, using either a vertical drop curtain equipped with a weight pipe, or a side track operating system that allows the shade to be opened or closed at any position along the vertical drop. 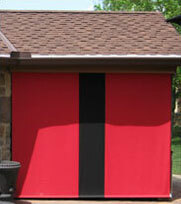 Side track drop roll curtain systems are useful for creating a "room" effect on your Carlsbad patio or deck. After serving 1000's of satisfied customers, at SunMaster Products, we pride ourselves on providing innovative sun shade solutions for any residential or commercial space, and our attractive sun screens, solar screens, and blackout shades are the ideal solution for providing your Carlsbad home, business, or industrial facility with optimal protection from the sun's heat as well as its damaging UV rays. At SunMaster Products, we have over 40 years of experience in providing comprehensive fabric die cutting and contract/production sewing services, performed onsite at our state of the art, full service fabric die cutting and production sewing workshop located in North San Diego County. This facility enables us to provide these exceptional quality services at the lowest prices possible for businesses and manufacturers, and for this reason, we are San Diego County's best value for competitively priced fabric die cutting and production sewing services. Call us today in Carlsbad. Call the experienced professionals at SunMaster today, Carlsbad, California. We offer free onsite estimates to all of San Diego County and the surrounding areas, and are licensed, bonded, and insured.